There was a lot of buzz in my Facebook feed recently about the latest album by American prog rockers, Kinetic Element. With a third album coming together in 2018, the fuss was all about the band adding guitarist Peter Matuchniak to their ranks. Peter's figures prominently in my CD collection with his individualistic and easily recognized style of playing on his solo albums, Gekko Projekt's two albums, Evolve IV, recent Marco Ragni albums, and last year's well-received and highly-rated Bomber Googles album, 'Gyreland'. I admit that I didn't know anything about Kinetic Element except for that they were one of the many excellent bands signed to Melodic Revolution Records, a number of whose artists have CDs on my shelf. 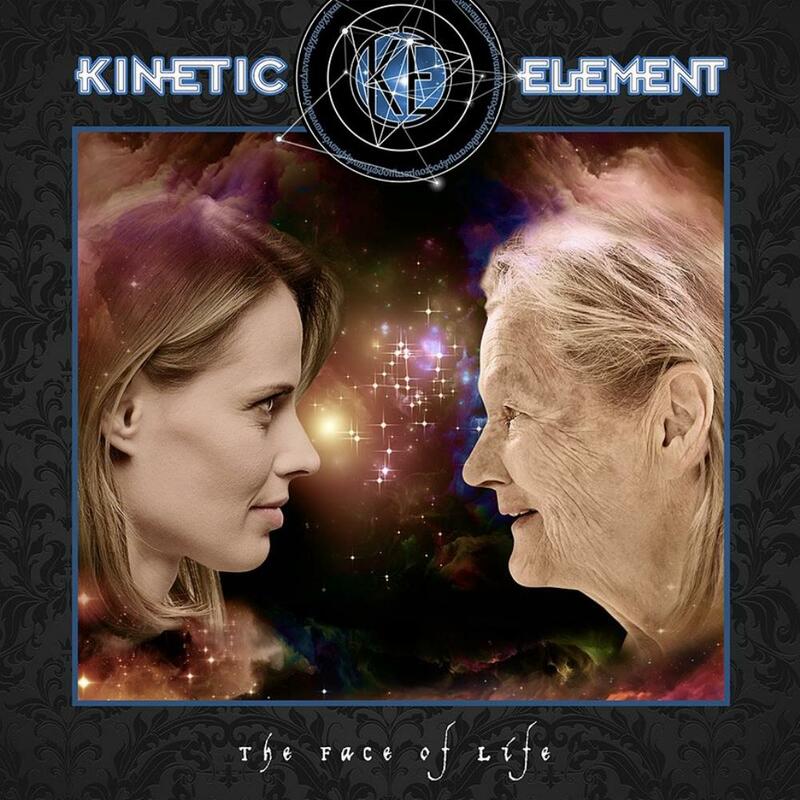 According to the MRR web site, Kinetic Element had really hit their stride on this third album, 'The Face of Life'. A band whose influences run deep in classic seventies prog, there might be some concern about the music being too 'retro'. However, after the first listen I quickly arrived at the conclusion that if a band can play classic-prog-inspired music this well and sound like they are having so much fun doing it, then there is no shame at all in being retro. This band really nails it! 'Epistle' is the opening track and a great warm up to the album. Peter Matuchniak's guitar playing is instantly recognizable. The band show off their skills as a modern symphonic prog band with every intention of making the past sound fresh and exciting with their own musical skills. The vocals remind me a lot of Elephants of Scotland, another band who exhibit great talent for making retro prog sound alive and kicking. 'All Eyes Open' is the first of two epic tracks, this one just shy of 16 minutes. The a cappella intro with short instrumental bursts intervening will remind one of Yes and Gentle Giant alternating. Then the song comes crashing in with a big organ solo and a choppy, muted, seventies guitar that reminds me of, among many others, a part in 'The Revealing Science of God' and the Space 1999 theme. Synthesizer solos, more organ solos, all courtesy of Mike Visaggio. If 'retro' is a dirty word and 'retro prog' an oxymoron, then by now you should just forget about any reservations you have. Kinetic Element's music is expertly executed. It's powerful, exciting, beautiful, and a real showcase for rock musician talent. Just listen to the 8 to 10 minute mark passage. It might have 'we grew up with seventies prog' stamped all over it but, man, that's some ripping music! The title track is the second epic, running at over 19 minutes. The first five minutes are all intro with some dramatic piano parts. I couldn't help pick up on Peter's melodic guitar playing around the 11-minute mark before the music switches back to a vibrant, upbeat passage with an organ solo that reminds me of classic Kansas. This is followed by a synthesizer solo that has me thinking of Dave Stewart when he played will Bill Bruford. Mike Visaggio is a genius and he's certainly letting us know that! Overall, whatever price you paid for admission, it's all been totally worth it so far. The closing track, 'Last Words' begins soothingly with something that could be a blend of UK and 'Tales from Topographic Oceans'. The vocal melody of the chorus is very catchy and memorable. A bonus track appears on the CD, which is 'Last Words' without the intro. The highlights of this album are the incredible and varied playing of the two epic tracks, though both 'Epistle' and 'Last Words' earn their places on this album. Whatever praise has been given for this album up to now, I completely agree. The music of 'The Face of Life' shows us that Kinetic Element is a band that knows exactly what it's doing and how to do it!